In previous lessons I gave an introduction about frame-relay and explained how to configure frame-relay point-to-multipoint. In this lesson we’ll take a look at frame-relay point-to-point which is far easier to configure. Here is the configuration for the hub and spoke routers. You only have to specify encapsulation frame-relay on the physical interface. The rest of the commands are on the sub-interfaces. Your router can’t read your mind and find out on which sub-interfaces which DLCI’s should be so you have to configure it yourself. 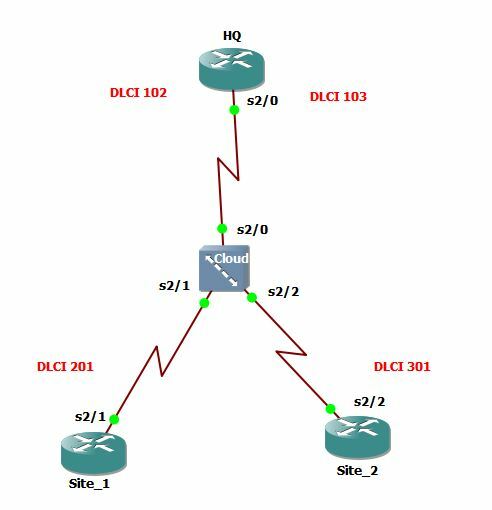 We don’t use the frame-relay map command for point-to-point sub-interfaces but you have to use the frame-relay interface-dlci command here. 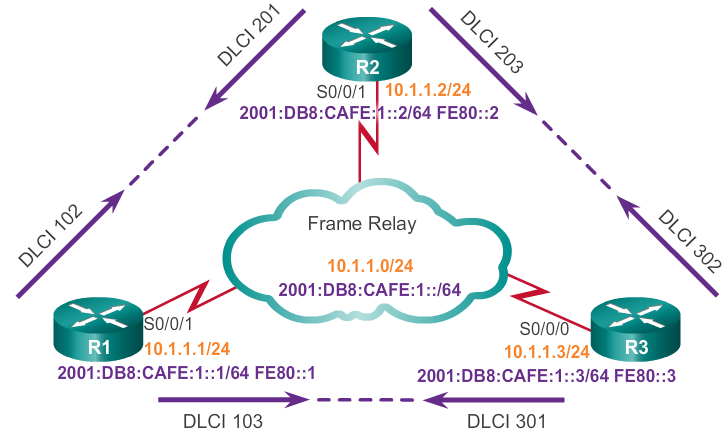 There are a couple of options for creating a frame relay topology. Frame-relay can be tricky when implemented with OSPF. Can you tell us a little bit more about your configuration? Please specify in more detail the problem that you’re facing so that we can address it more effectively. Now based on your configuration, what I do see immediately is that in your frame relay interfaces, you are missing the ip ospf network broadcast command. This changes the default OSPF network type to allow for broadcasts to be sent over non broadcast topologies such as frame relay and to allow them to create OSPF adjacencies. In order for OSPF to function, you require the broadcast keyword for both the frame-relay map command and the ip ospf network command. If you don’t do this, you can always make OSPF work by manually configuring the neighbors. NetworkLessons.com explains complex and hard to understand networking concepts in just plain English. It's hard to miss the concepts. Thank you for all of your hard work. It did help me, and will definitely help somebody else. NetworkLessons.com is a very good resource to get practical. They offer good information for the certifications and detailed lessons which are efficiently explained. I started to avoid extensiveness in studying for re-certification and prefer their much more compacter study materials. They offer very helpful information to make me accomplish not only professional networking tasks but also refresh my knowledge all the time and be up to date in my expertise.